Engagement parties are getting more and more elaborate these days. Organizing an engagement party today takes a lot of time and effort. Here is a checklist that can help you when you are organizing an Indian engagement party. Before you choose the date and time for the engagement party, you will need to consult with your elders and also an astrologer to find out an auspicious date. You must try your best to make it on a date which will be convenient for your friends and family. The best choice would be to conduct the function on a Saturday or Sunday. After you have confirmed the date, you have to take a count of the guests expected and then decide a reception hall according to the number. You have to block the venue for the date by paying some advance money. Make sure you collect information from both the bride’s and groom’s family before you work out the number of guests. You must also choose the number of guests you invite according to your budget. The best option is to send online invitations for engagement to all your guests. The easy to use RSVP option enables your guests to respond as soon as they see the invitation. This way you can get a count of the number of guests who are attending very soon. You must understand that you cannot single handedly handle everything. You need support from everyone who can help you. Make a list of the things to be done and then assign people to each task. This way you can get help with all the arrangements and you don’t have to run around with everything. Choose a caterer: According to your budget and the food preferences arrange a caterer for the day. Confirm the quantity of food required only after you get a correct count of the number of guests. Decorations for the venue: You must also make arrangements for decorating the venue. Alongside make arrangements for entertainment and a photographer as well. Decide your attire for the day: Make sure you decide what you are going to wear on the special day and make sure you complete all the shopping well in advance. You must not be running around for shopping for your accessories on the day before your engagement party. You must definitely reconfirm all details like the venue, decorations, caterer, entertainment and the florist arrangements to make sure that there are no last minute surprises. If you don’t want to take any stress for the arrangements of your engagement party, just hire a wedding planner who will take care of everything. However, make sure you choose someone who has previous experiences and don’t forget to check the online reviews of the one you choose as well. You need an engagement party to let all your friends and family know that you are getting engaged. This is a great celebration occasion in India. When you plan the party, you have to design your invitation card with details like the theme of the party and also give the invitees an idea of how formal or casual the event is going to be. Make your engagement party invitation look creative and something that stands out.The first thing you have to think about when you are looking for engagement party online invitation is style of invitation. It can range from casual to formal and most of the time, it is less formal than the wedding invitation. Engagement parties in India are held in the midst of the closest of kin and hence you can make it really casual. The most important thing is that your engagement party invitation card must include all the details of the party. The venue, time and all the route to the venue must be included for the convenience of your guests. Online invitation cards now have the option to include all these details in a click of a button. You can also have a wedding website, where you can include details of your engagement party as well. However, for the older generation, it would be best that you go for printed invitation cards.Several websites offer you Engagement party planning ideas to choose from. You can go online and search for some unique ideas to be used on your engagement party in India. Your engagement day is the first step to a new stage of your life. Engagement parties in India are celebrated in great pomp and splendor. 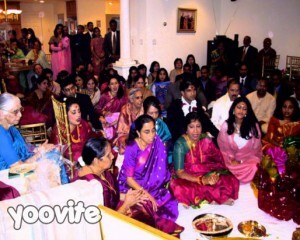 Indian engagement parties are usually arranged after the parents of the bride and bridegroom decide the wedding date. The engagement day is when the wedding date is announced to all family and friends. Online Invitations are now very popular. Free online invitation tools offer a huge range of templates for Indian engagement parties. You simply have to choose your favorite template, enter all the important details and send the invitation to all your guests via email. The RSVP option provided with these free online invitations allow the guests to mark their food preferences also. Indian Engagement invitations can be formal or informal. It is important to choose perfect wording for your online invitations. Here are a few engagement invitation wordings that can be used on your online card. You can also use informal invitation wordings as follows. Veena and Aravind are getting engaged! Come celebrate with us on the occasion. Come and join us for an engagement party with our family. You can use the Internet to find wordings for your onlineIndian engagement invitations. After you have selected the template and the right wordings, simply type them in your engagement invitations online. Just have fun writing your engagement invitations. Best wishes for your engagement party. Congratulations! You are getting engaged! Along with being in the celebration mode, you must also be stressed out with all the planning and expectation. Planning an engagement party is indeed a lot of stress and the best way is to do everything in a timely manner. Don’t wait until the last minute to get everything done. Make a to-do list and follow up everything on time. Here are some important tips to plan your engagement party in India. The first thing that you have to do is decide the date of the function. In India, we usually decide an auspicious date according to advice from religious leaders and elders. We also have to check the availability of the religious place or the preferred hall on the date of the ceremony. You have to first make a rough budget of your expenses and make sure that you don’t go overboard and get into debt for celebrating the special day. Don’t forget, you have the wedding day coming up which is even more special! Make a rough list of the number of guests you will be inviting for the Indian engagement party. You have to decide the size of your hall based on the number of people you are expecting. The next step is to book a reception hall and the entertainment options that you are planning for the day, if any. Get a quote from several halls and choose one that gives you the most competitive offer. Most of the halls in major cities like Bangalore, Delhi, Kolkatta, Mumbai, Pune, Kochi and Chennai now offer special packages for marriage parties. You will want to keep the memories of this day forever and for that you must hire a professional photographer for the day. If you have a friend or relative who knows photography, then you could save the money that you have to spend on professionals. After you have decided the date and the venue, you have to start inviting your guests. This is one stage where you can save a lot of money. Printed invitation cards are getting out of vogue. We are in the Internet age and there are very few around you who do not have an email id. The best option is therefore to use free online invitation tools to send Indian engagement invitations. The RSVP option available with these tools allows you to get an actual count of the guests well in advance as well as their food preferences. Everything is made so easy with Indian online invitation sites. You have to just choose a template, fill in the important details and send your invitation to all guests via email. With everyone having a Smartphone these days, guests can immediately RSVP and let you know if they will be there. You might also need to print out a few cards for the guests who do not have email ids. Order the food according to the preferences made by the guests through the online RSVP option. You must include both vegetarian and non-vegetarian options when you are holding an Indian Engagement party. Entrust the tasks to several people. You do not want to take charge of everything and mess things up. It is best to divide your responsibilities to family and friends when you are planning engagement parties in India. So, plan everything in advance and make your engagement day extra special with these great tips.